It appears another player’s fate has been determined. Some apparent closure, and expected, on the status of Georgia WR Michael Chigbu, who Kirby Smart said this spring was thinking of not playing football anymore: Chigbu is NOT listed in Georgia's new 2018 media guide. So it appears he has indeed called it quits. Best of luck to you, Michael. And we’re back to Lincoln Riley… again. I really, truly, honestly thought I was done with the Lincoln Riley kerfluffle, but people keep talking about it. “I know what he was saying. And he came right back and said that it wasn’t a shot at Georgia, it was a testament to the offenses in that league,” Beamer said. “It’s all about the plays you run, and the more plays that offenses run against you, the worse your stats from a defensive standpoint are going to be. And out there in that league, everybody’s running 80, 90 plays a game. So your defenses are out there for a lot more if they can’t get themselves off the field. So, now it’s the number of plays that sets Big 12 defenses apart. Let’s look at the tape, shall we? You won’t find a single team on that list that averaged 80+ plays a game last season. Oklahoma State was tops in the Big 12, with about 77.5 plays per game. Yeah, the bottom of the list is populated by more SEC teams, but most of those didn’t enjoy a postseason experience. (Florida, by the way, averaged about four more plays a game than did Kansas State. It’s just that the Gators played two fewer games than KSU did.) Beamer’s exaggerating, in other words, which makes it hard to accept his rationale. 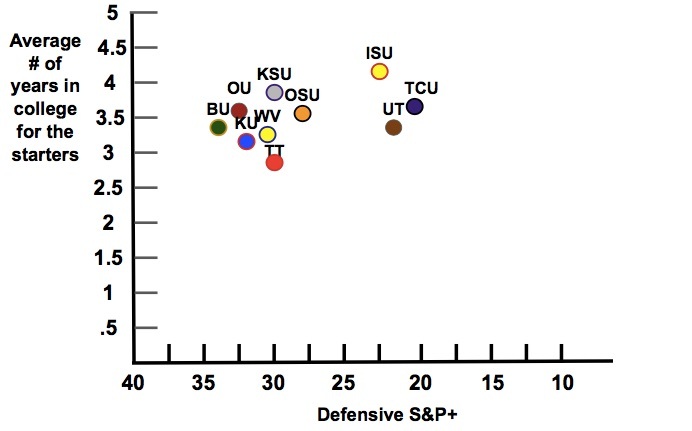 What I’ll share with you in the meantime is an Ian Boyd post that explores the factors involved in the better defenses in the Big 12. See if you can catch a difference in approach to how the SEC operates. Originally I tried to look at this by examining the average star ranking of DL recruits for every team over three years but quickly found that there was little to no correlation there either between good defense and star ranking. The consistent problem has been that Texas and OU always recruit the highest ranked players and don’t always play even good defense while TCU rarely recruits competitively ranked players but consistently rank amongst the league’s better units. Iowa State, TCU, and Texas all broke out of the pack and the former two did it with pretty standard talent levels (per rankings) while Texas did it with their usual blue-chip laden roster. Here’s a look at how these things shook out by experience level. There’s a few things on here that both dispel and prove the “talent matters!” perspective. One is that you can see how K-State jumped up above most of the league on the Y-axis by virtue of playing a lot of fifth year seniors so the argument could be made that their higher level of experience negates the recruiting ranking disadvantage. Especially since the 2017 K-State roster included a large number of former 0-stars that were walk-ons. On the other hand, you can see that Texas was in some sense less experienced than Iowa State or TCU but “made up for it” with talent. However, Texas’ “inexperienced talent” included a ton of third-year players who’d been starting for multiple seasons so the idea that talent overcame a lack of experience isn’t that strong an argument for explaining Texas’ rankings relative to TCU and Iowa State. Believe it or not, there is actually an athletic department in the Southeastern Conference that failed to finish in the black for the last fiscal year. What some may find disturbing is that the athletic department failed to turn a profit resulting in a $4.5 million deficit for the first time since 2012. The problem, as you can probably guess, is football. During the 2016-17 fiscal year, ticket revenue shrank by about $1.15 million, down to $18 million. Sterk said his department has secured about 1,000 new football season ticket holders for the 2018 campaign, but football season ticket totals overall are down from this point a year ago. Yeah, good luck with that. I suspect he knows there’s something else that would do more for that. Winning will help generate more palpable excitement, of course. The Tigers return their top players on offense and defense from a season ago in quarterback Drew Lock and defensive lineman Terry Beckner Jr. But Sterk hesitated to say this is Odom’s best opportunity yet to prove he’s the right person to lead the football program. Woo, no pressure there, Barry. Good thing you brought SOD on board to help. For Georgia’s tight ends, it’s all good, man. At least that’s what their former position coach says. Shane said he’s confident that Georgia’s tight ends will flourish under the guidance of Jim Chaney, who is moving over from quarterbacks to coach that group after handling the quarterbacks the last two seasons. James Coley has moved to coaching quarterbacks from receivers and been elevated to co-offensive coordinator. Georgia is going to utilize the tight ends more this season is the meme that never dies.